A prominent lawyer Melbourne barrister, Ross Ray QC, was killed recently in an accident that was both ironic and tragic in its facts. 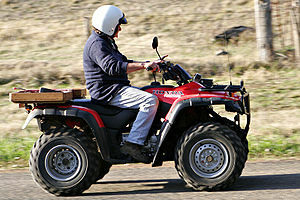 Ray was the lead litigator fighting a requirement of safety rollbars on “quad bike” or off-road vehicles. He was killed on his farm in Mansfield when his quad bike rolled over and pinned him due to the lack of a rollbar. In 2005, Ray appeared in court on behalf of quad bike maker Honda to dismiss a coroner from an inquest into deaths in Victoria and Tasmania involving quad bikes. He sought unsuccessfully to disqualify Victorian coroner Graeme Johnstone from the inquest after the coroner expressed a view that an absence of roll-over bars on quad bikes led to the deaths of two people. Ray argued that this view was evidence of bias, but the court disagreed. Quad bikes accounted for almost 40 per cent of all farm deaths in Australia last year. Quad bikes have been the leading cause of death on farms for the past five years with more than 200 people killed while riding the bikes since 2001. Three wheeled ATVs were banned for sale within the US in 1987-88 due to a propensity for accidents and fatalities. Despite having a fairly small sample pool, the Aussie Health & Safety people have done a study and concluded that quad rollovers are the top cause of accidental deaths on Australian farms. (BTW, to give some context, that’s about 15 deaths per year. So, we are considering something that would be a very small fraction of the deaths from, say, road vehicle drivers distracted by mobile devices.) That stat was apparently compelling enough that JT copied it into his snippet. Anyone who has seen such vehicles used on farms should know that they are actually not especially dangerous except in limited circumstances. For instance when someone is driving them too quickly (these are fun vehicles to zip around it, but that isn’t appropriate for a farm environment). Or, when someone is towing a load behind them at speed or on a slope, since these short wheelbase vehicles often lack the capacity to stop a trailer (and those trailers are often not hooked up to use their own brakes) and stopping in those conditions can cause the quad to jackknife and then roll. Both such cases are easily addressed with common sense practices. To my mind, I am not sure why there is a legislation issue here. People working on farms don’t want their lives to be endangered. Teach them better practices and let them decide whether their equipment needs additional aftermarket gear. One answer that floats there to be seen if one is capable is that if you want to ride a motorcycle without a helmet, you carry insurance that would offset the potential of health costs to society. That’s the system in Florida, no helmet=insurance, helmet=no insurance. Pay at the pump. As for mountain biking, I have yet to see a mountain biker stupid enough to not wear a helmet. Regarding rock climbing and the rest, typically if you do that sort of thing, you are more into the safety than the experience. It goes with the territory. And, if you do slip up, you are likely to go out quick and inexpensively. All in all it is a question of degrees. Motorcycles and other sports are not so much the same except when done as sports. A motorcycle racer is usually if not always fairly well padded. The issue is the idiot who gets a motorcycle, finds something in the constitution about not having to wear helmets, and ends up costing the health care system or us, millions. Wear a helmet or carry insurance. Or we should arm every American and let Darwin’s concepts take care of the overpopulation by idiots of this country. If we were to ban everything that others do not like nor want others to participate in, we soon will have nothing left to do, eat or drink. I for one am tired of the ‘Nanny Statists’ running around trying to inflict their will upon everyone else for ‘the greater good’ or other ridiculous arguments that amount to nothing more than the desire to control others to either feed their own personal ego or satisfy a complusatory mental illness. I find that those who wish to control the actions of others the most, usually use the ‘protect the children’ excuse. They also are almost always mentally ill and have an insatiable need for control. The less control they have, the greater their anxiety and/or anger rises. Much of the Nanny State nonsense that goes on today is to be blamed on lawyers, insurance companies and politicians. How much better the world would be if the Statists would mind their own business and allow Free Will to reign supreme. No forced roll bars or helmet laws. But they should all have to sign organ donor cards. I have a lot of people in the medical field, and I would never sign an organ donor card. That is a good way to get killed in a hospital. There is a ton of money for the docs and the hospital and ZERO for the donor and their family.